With President’s Day approaching, many preschools and classrooms will explore a handful of U.S. Presidents with stories, songs and reports. For parents looking for homework help, or to inspire kids with presidential examples beyond George Washington and Abraham Lincoln, you can take your young learner on a fun and educational meet-and-greet with the 44 U.S. Presidents. Who wouldn’t want the chance to defend the Earth from aliens? There’s a section for learning via flashcards about the presidents, but the real fun begins when quizzed about the material in order to earn president heads that you can fling at alien invaders ala Angry Birds. There are two other gaming opportunities: “Heads of State” where you choose the correct president head floating in space to answer a question, and “Executive Order” where you put the presidents in correct order. 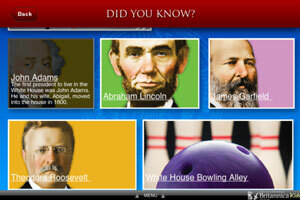 Review each president's fact sheet with years in office, birthplace, trivia, party, vice presidents and more. Then test yourself with in quiz mode. There's also a slideshow of all of the U.S. Presidents. Check out profile info for all presidents, quizzes to test your knowledge of the U.S. Presidents, and a “Hail To The Chief” sing-along with lyrics and music. It includes some fun facts about Mount Rushmore, The Oval Office and The White House Bowling Alley among other related topics. This quick memory game with several different modes of play. Match sets of 8, 12 or 18 different president portraits with their name and chronological order across four rounds of play that speed up each round. You can play in word-only mode, or study the full gallery of portraits too. 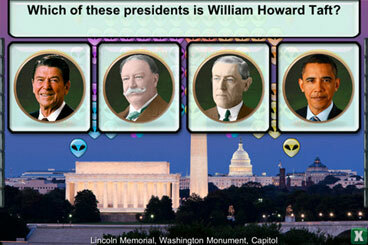 There are three levels of difficulty with an increased number of presidents in each set. Two players can play head-to-head. Do you know that Clinton's dog's name is Buddy and that Buchanan was the only president that never married? 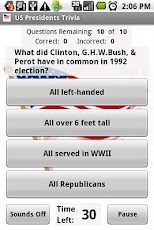 This US Presidents trivia quiz game will test your knowledge of their history, families, politics, names, and hobbies from Washington to Obama. The controls can be a little touchy, but it's still fun.